A famous photograph taken in 1940 shows plumes of black smoke surrounding London's St Paul's Cathedral (which miraculously, and thankfully, survived as all around it was being razed) as German bombers nightly discharged hundreds of bombs and incendiary devices causing devastation across the city, leaving it one of the most dangerous places to live on Earth. Herbert Mason’s famous photograph taken on the night of December 29, 1940, captures the silhouette of the dome wreathed in the smoke and flames of the destroyed city. The photograph was published in the Daily Mail two days later, with a caption stating that “it symbolises the steadiness of London’s stand against the enemy: the firmness of Right against Wrong”. However, London in 2009 is a much different city. 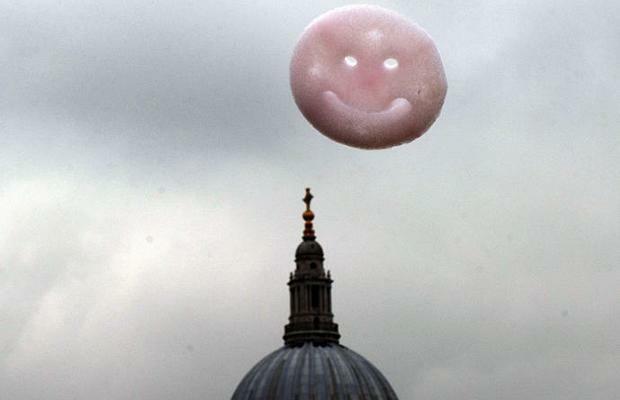 A new photo of St Paul's Cathedral shown from a similar angle as the 1940 photo shows nothing more sinister than a smiley face floating past. 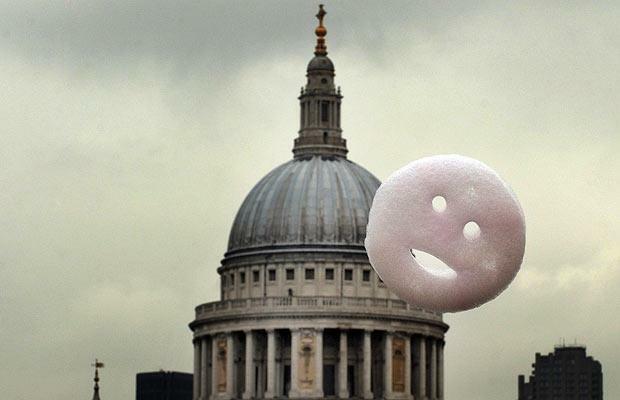 More than 2000 smiley-faced pink clouds were released in London today, so any Londoners thinking that they may have drunk too much Strongbow were NOT imagining things. 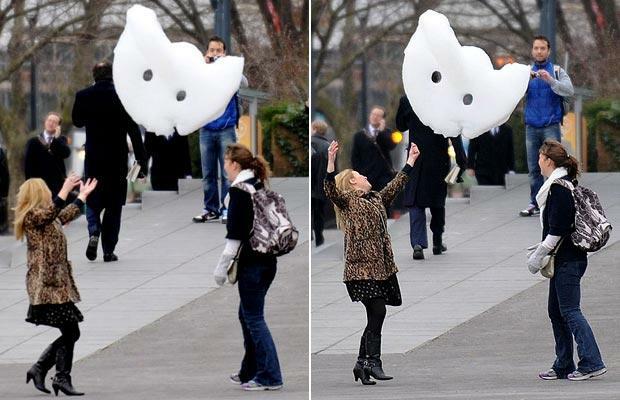 The artist who created them said he wanted to cheer people up during the recession. 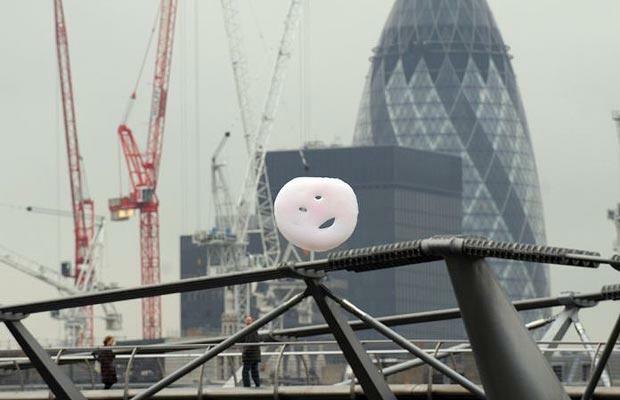 As well as that, the installation aims to show that creative industries have an important role in the British economy and should not be neglected during the recession. The creative industries will grow at an average at more than double the rate of the rest of the economy this year. 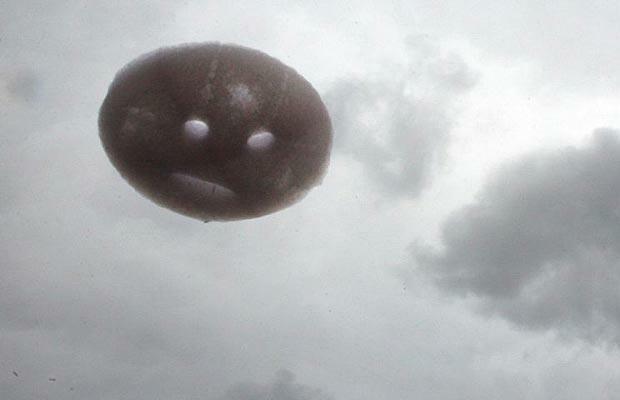 The clouds that linger over London are often described as dark, threatening and stormy, but rarely are they described as “happy”. Until today. 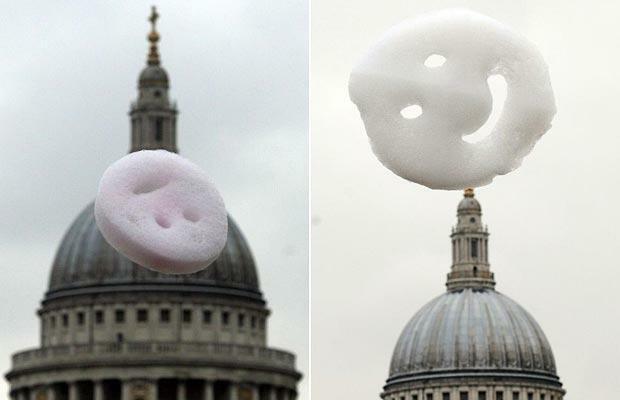 More than 2,000 smiley-faced pink clouds were today released over the capital from outside the Tate Modern on London’s South Bank. 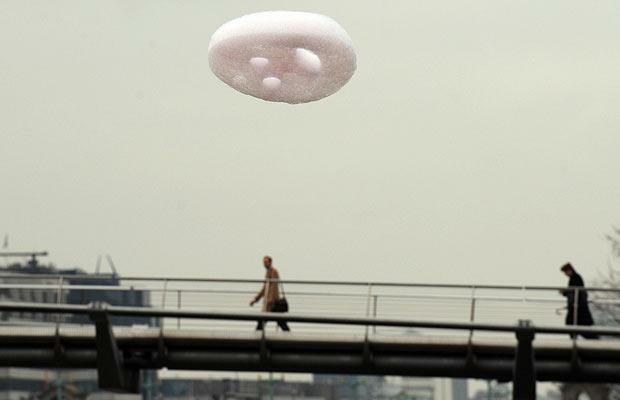 The 2,057 clouds - made of helium, soap and vegetable dye - drifted over the Thames and the City of London. 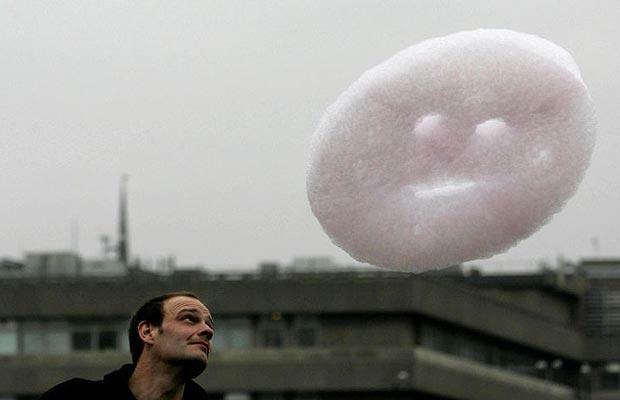 One was released every seven seconds from eight o’clock this morning, and the eco-friendly clouds lasted 30 minutes before dissolving in the air. 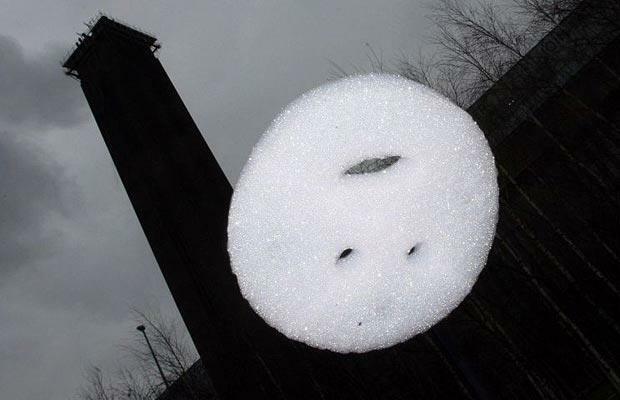 As well as alleviating the doom and gloom of recessions and downturns, the installation aims to show that creative industries have an important role in the economy and should not be neglected during the recession. 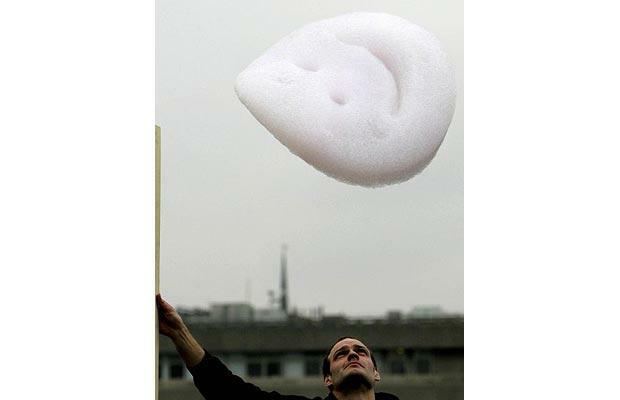 A recent report by the National Endowment for Science, Technology and the Arts predicted that creative industries will grow at an average at more than double the rate of the rest of the economy this year. The artist explains: "I just wanted to make a piece of work that would cheer people up a bit"
"This was the most straight forward way I could think of to literally contribute something happy to the atmosphere"
"I'm also keen to help people remember that the success of British cultural industries is relatively new, the Tate itself wasn't there a decade ago"
"I know at times like this it's easy to make creativity a low priority..."
Last edited by Blackleaf; Feb 25th, 2009 at 02:27 PM..